Different types of fish are known for their coordinated movements that make themselves look like one big, shimmering blur. This behavior, known as schooling, is an effective way of avoiding predators! It’s very difficult for predators to pick out one fish, separate it from the group and chase it down. And while visitors can see this behavior in lots of exhibits, it’s on full display in the Schooling exhibit! Close-up of the school. How many fish do you see? Blueback herring, Alosa aestivalis, have been a staple of the Schooling exhibit, showcasing the ability of a fish species to act as one collective unit. After a recent group of herring grew too big for the exhibit, they were moved to a larger exhibit at the Montreal Biodome (where some of our young researchers studied wolffish). This made way for a new school! 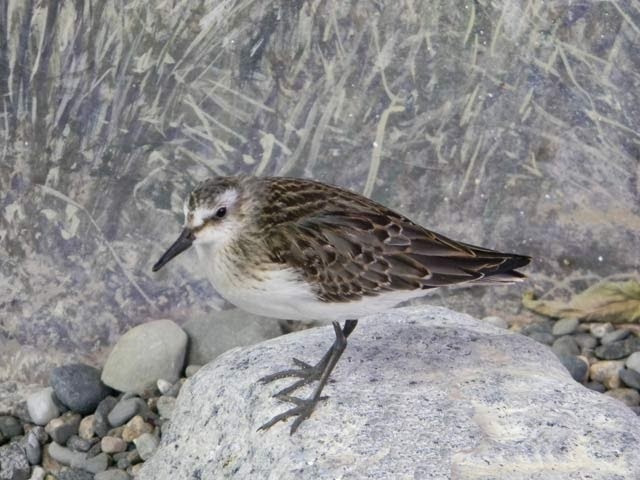 In October of 2012, Aquarium staff and volunteers headed to Buzzards Bay to collect some new exhibit animals. After being granted a special permit by the Massachusetts Division of Fisheries, the crew used seine nets to catch close to 2,500 young fish! Having lived and grown behind the scenes for over a year, it was time for them to make their big splash. 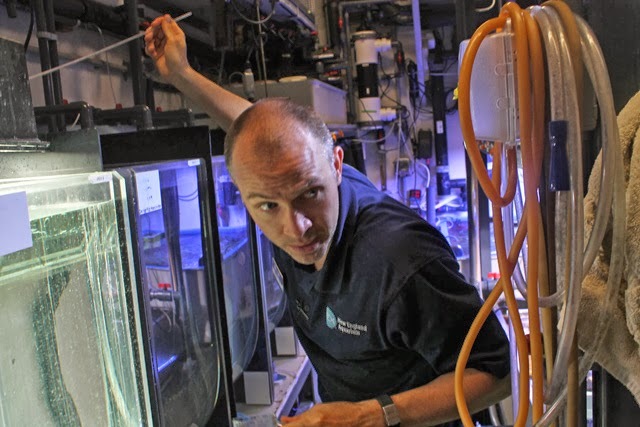 How do you move approximately 2,500 fish from one tank to another? With lots of help! Fortunately, the holding tank and exhibit are only a few short steps away from each other, making the process a little easier. 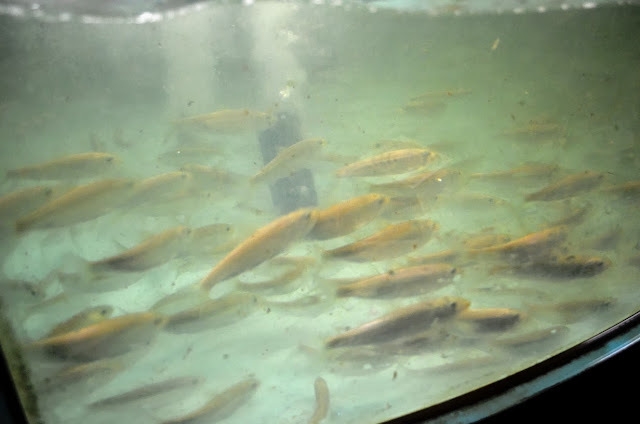 Two aquarists would gather small batches of fish inside the holding tank. 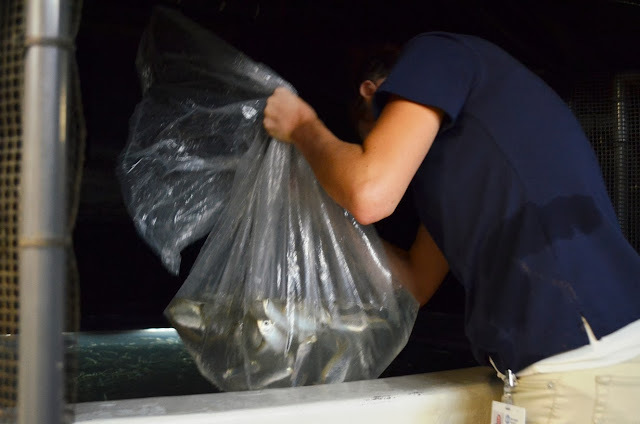 Once a batch was collected, the fish were transferred in bags to a waiting group of helpful staff and volunteers. With some quick, careful steps the fish were at their final destination. Lots of helpful hands make moving easy! 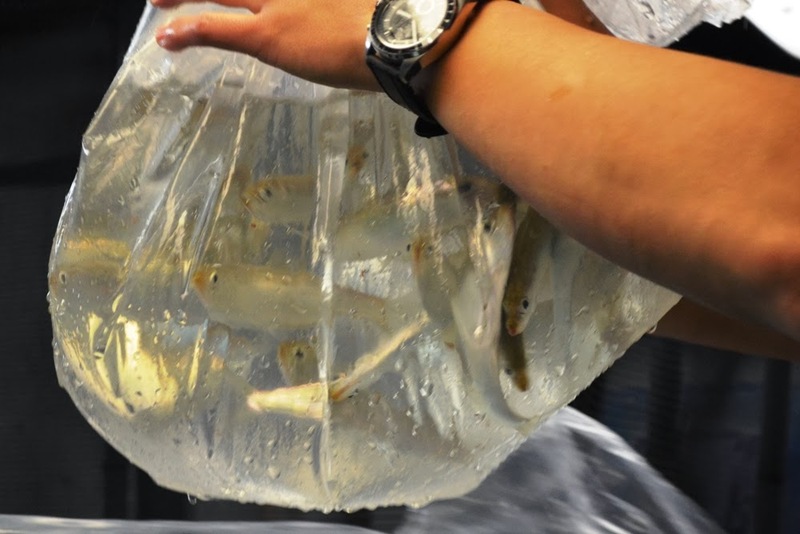 Once the humans, and the fish, reached the exhibit, the bags of fish were gently lowered into the water. In position, the bags were opened and the new inhabitants would be off—the fish quickly swimming to join the rest of the school. It was then back to the holding tank to repeat the process many times over! 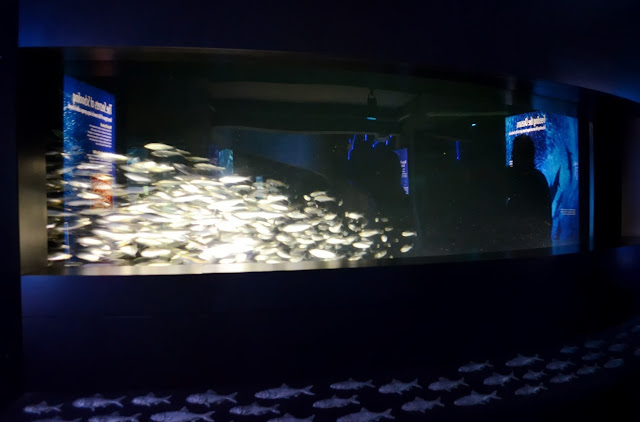 A new batch of herring are added to the exhibit! It was amazing to see the new school come together! The herring seamlessly swam together, acting as a united group. 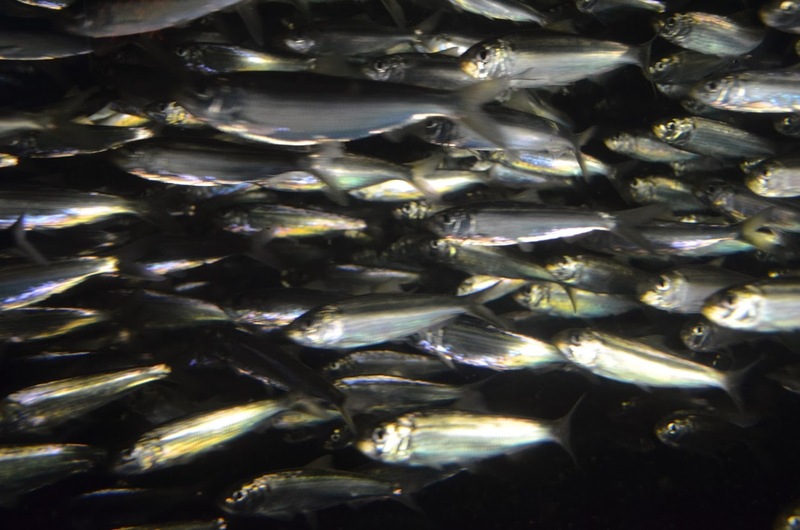 And as they are still growing, Aquarium visitors will have lots of time to see this new shimmering blur of herring, swimming past the window in the newly stocked Schooling exhibit! The new herring getting used to their new home! Just in time for Halloween last year we introduced the rarest of specimens—a two-toned lobster with coloration just perfect for the holiday. 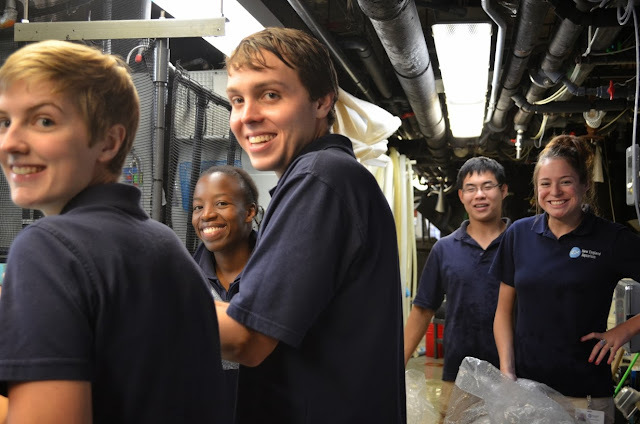 The lobster was new to the Aquarium and was behind the scenes for routine quarantine. But this year, she is on prominent display through this Sunday, November 3! Salem fisherman Dana Duhaime caught the lobster last year and knew right away she was special. He arranged to donate her to the Aquarium and sent her on with the name Pinchy, in honor of a giant lobster that appeared in a Simpsons TV episode. Pinchy has grown over the past year, and the molt of her discarded but amazing, two-toned old shell will also be shown by Aquarium educators. 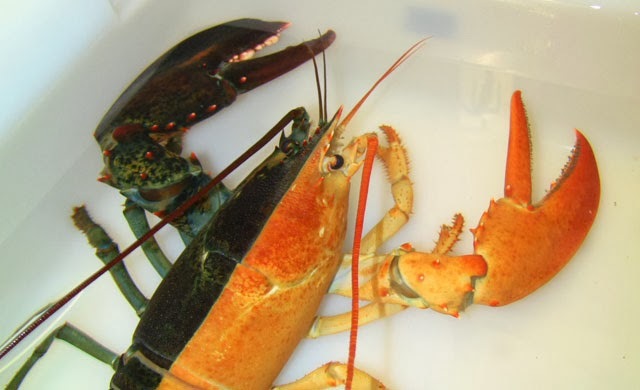 Perfectly split-colored lobsters are extremely rare occurring in about 1 in very 100 million lobsters. Among those rare two-toned lobster, orange and black is the most common combination. While these rare creatures sometimes show the sexual characteristics of both genders, but this lobster is a female. Learn how these splits happen on a cellular level. This animal will be on exhibit until this Sunday. Then she'll head behind the scenes again, where she'll make periodic appearances during the Live Animal Presentations. Plan your visit to see this remarkable animal in the Northern Waters Gallery at the New England Aquarium. Just in time for Halloween, the Aquarium has a special guest on exhibit in the fourth floor’s Yawkey Coral Reef Center. Known as a black widow, or the less frightening name of “black brotula”, the new Stygnobrotula latebricola is only a few inches long and is native to tropical waters from the Bahamas to Brazil. 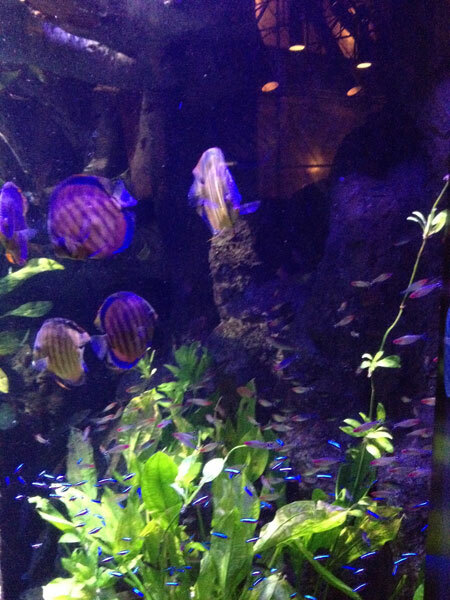 This new resident is rare to see in aquariums and is the first of its kind here at Central Wharf. However, they are also hard to see in the wild. 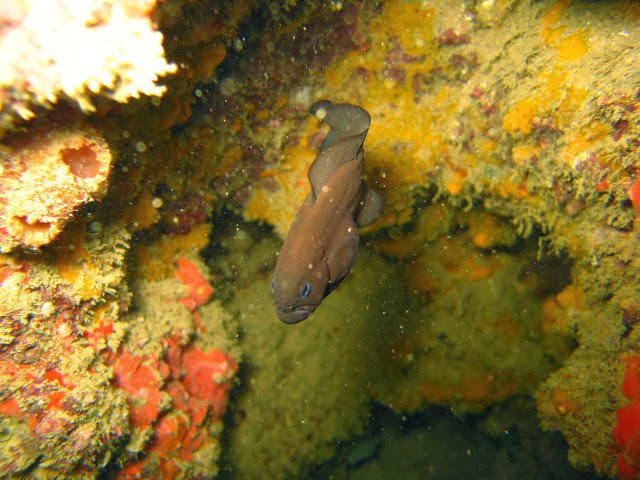 They are known as cryptic animals, using their shallow reefs and rocky ledge homes to hide during the day. This helps this slow moving creature to avoid predators. Lots of good places to hide! Though it does hide from time to time, our current resident can be seen out and about looking for food. 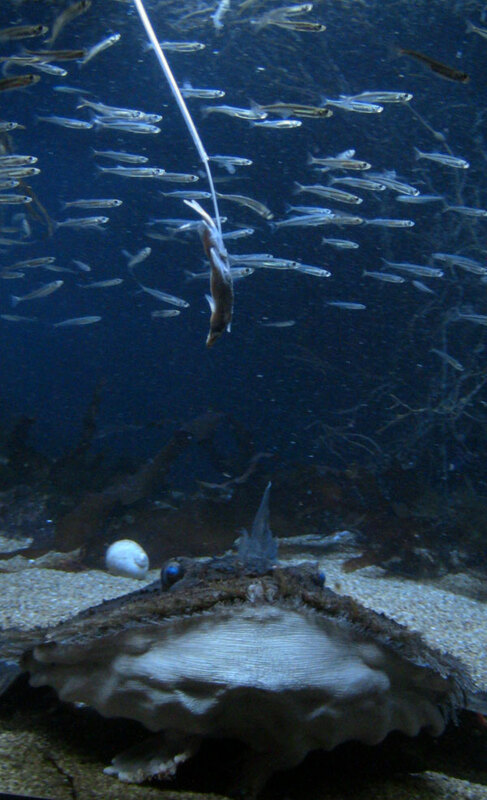 They eat small crustaceans, even parasites on other animals, and you can sometimes see small prey items floating in the exhibit with the brotula. 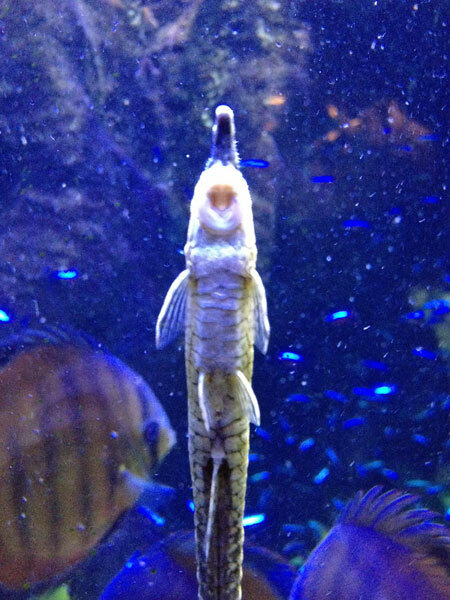 There’s no telling how long this creature will haunt the halls of the Aquarium. Make sure to come visit this special guest…if you dare! 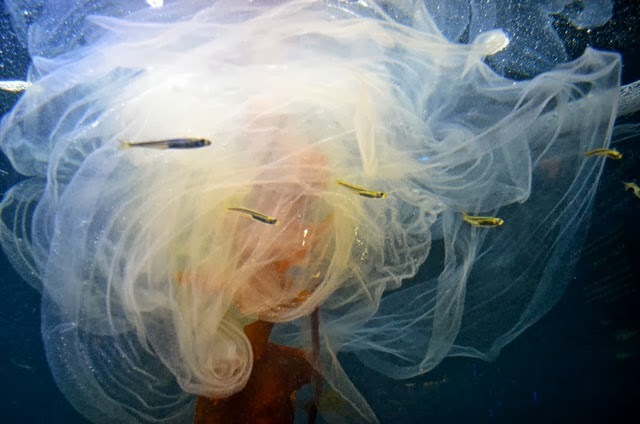 Goosefish Egg Veil: Three for the year! 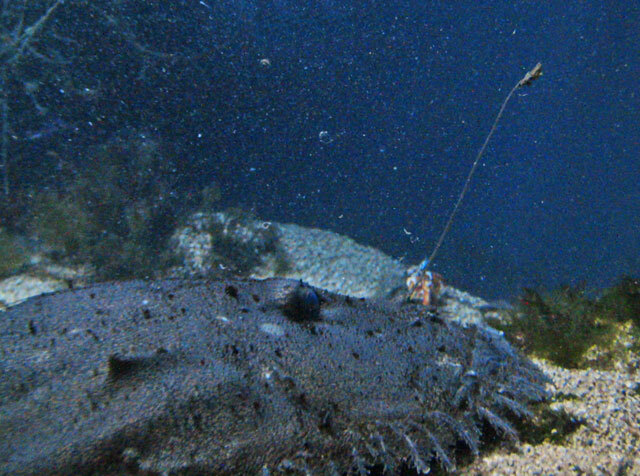 We've discussed the beauty of the goosefish egg veil before—three times this year, in fact! 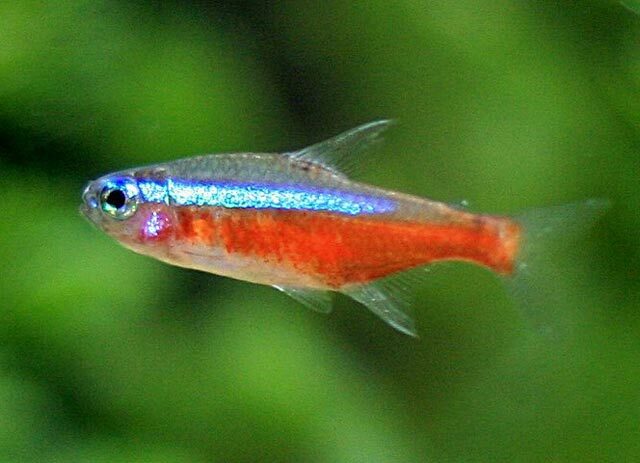 This uniquely beautiful fish has wowed everyone at the Aquarium by laying her third egg veil this year. And it never ceases to be beautiful. 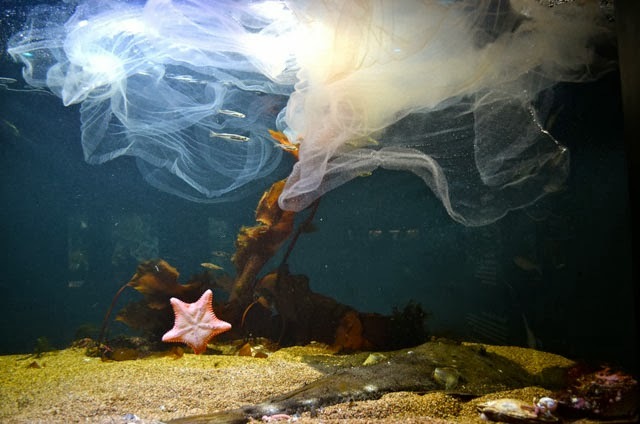 Just a few pictures of this graceful, gauzy, temporary addition to the goosefish exhibit. 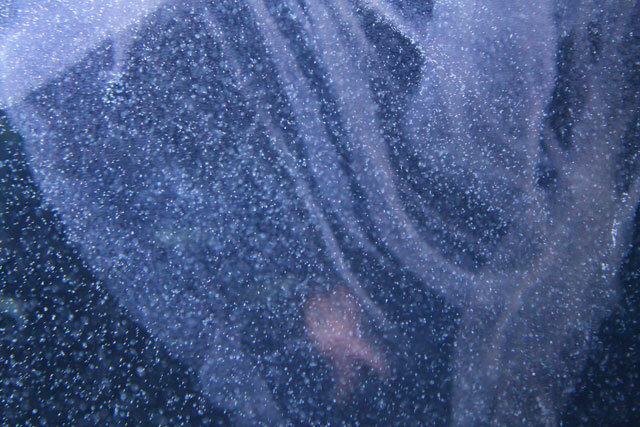 Educators describe the bubble net as similar to bubble wrap. This image illustrates this idea quite well, no? There are several hundred thousand eggs in this sheet, which can be as long as 60 feet. 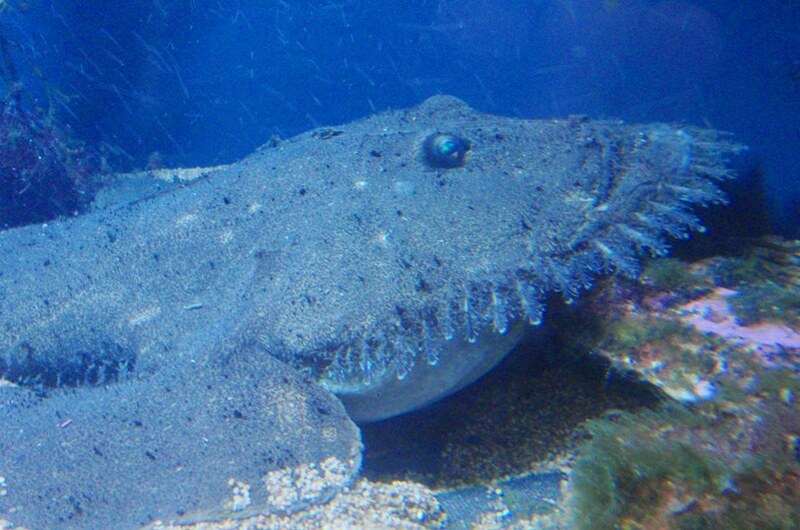 There is no male in this exhibit, so don't expect baby goosefish. 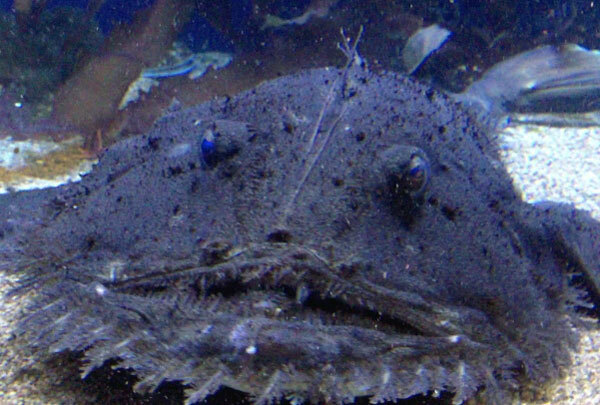 But this is still a really special occasion; the goosefish has never laid three egg veils in one year before. 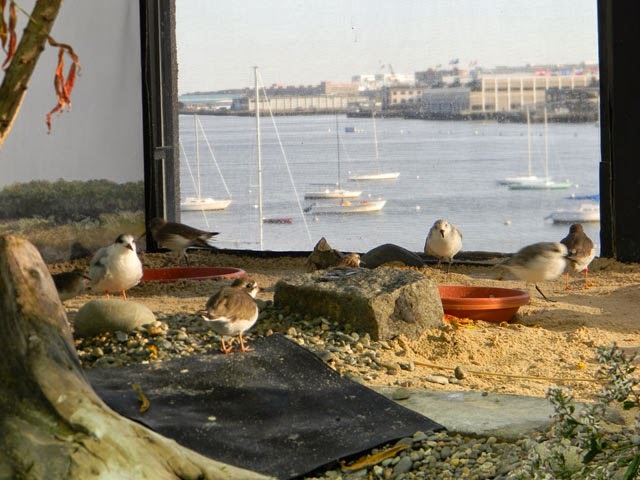 The eggs will remain in the exhibit for only a couple days, so if you want to see this amazing sight in person you should hurry to Central Wharf. Buy your tickets online and print at home, you'll be visiting this special lady and her egg veil in no time. How does your garden (eel colony) grow? You usually find them bobbing and swaying in their central exhibit, searching for a passing nugget of food. But in one blink of an eye, they can quickly disappear into their sandy burrows en masse—zooop! Meet the garden eels, slender and sometimes shy seafloor dwellers in the Yawkey Coral Reef Center. In this exhibit you'll find mostly brown and yellow garden eels. They are found in Caribbean coral reef ecosystems—like the one in the Giant Ocean Tank. They cluster their borrows together in a colony, and you'll rarely find one swimming around. 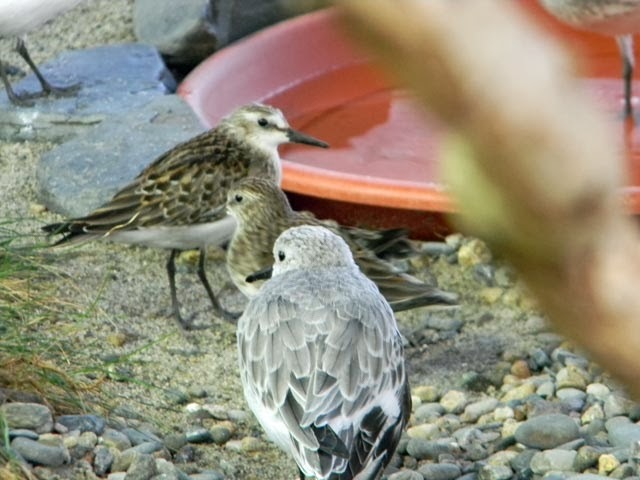 Instead you can see them pop their heads and bodies out looking for detritus or plankton to eat. With a mass of swaying garden eels rooted to the sandy floor, it almost looks like grasses—thus the name, garden eel. Each animal fits so snugly in its burrows, you might wonder how it managed to make that home. Well take a look at this video. 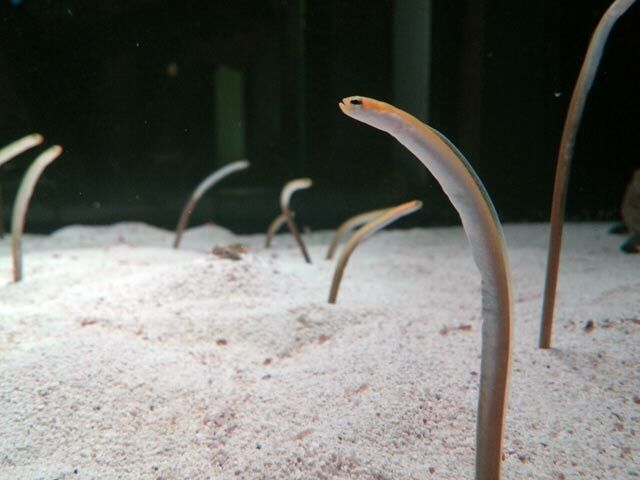 It was taken moments after the eels were introduced to their new exhibit this summer. 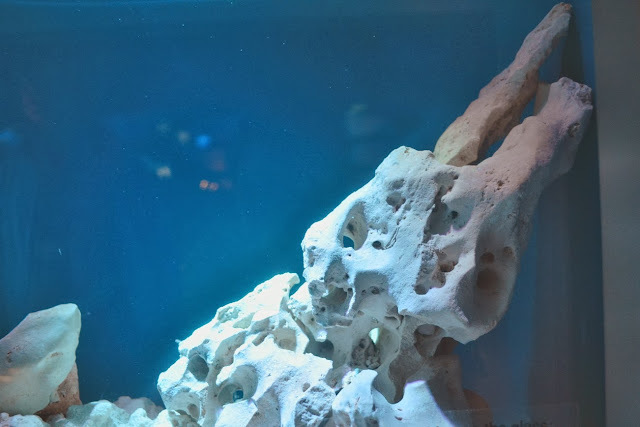 Watch one of them make its new home, the start of our garden eel colony! While garden eels are found on Caribbean coral reefs just like the ecosystem inside the Giant Ocean Tank, we think these special animals deserve a closer look. 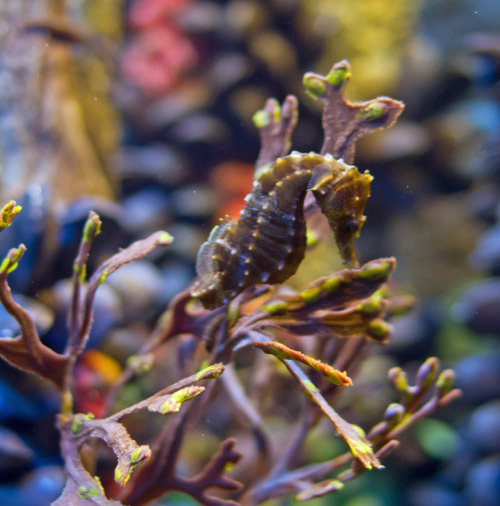 Their special exhibit at the top of the tank lets you get close to these graceful and fascinating animals. Just be sure not to spook them, because they can hide in a flash! Come by and take a look sometime. Buy your tickets in advance on our website, then you can print them at home. Just be sure to bring your camera. 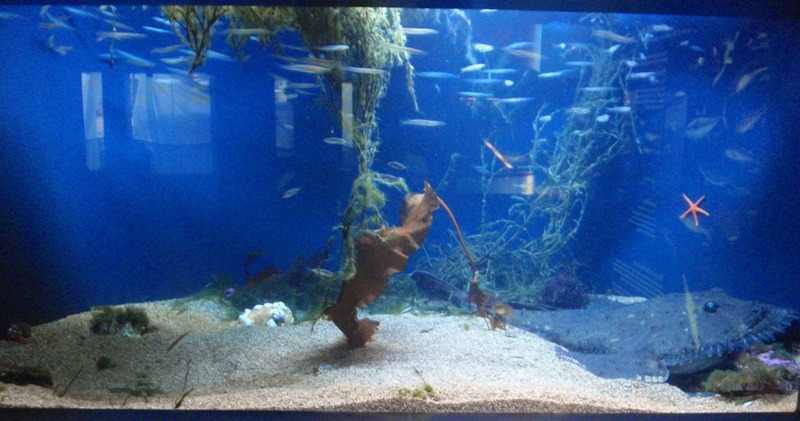 The Trust Family Foundation Shark and Ray Touch Tank is an Aquarium favorite. 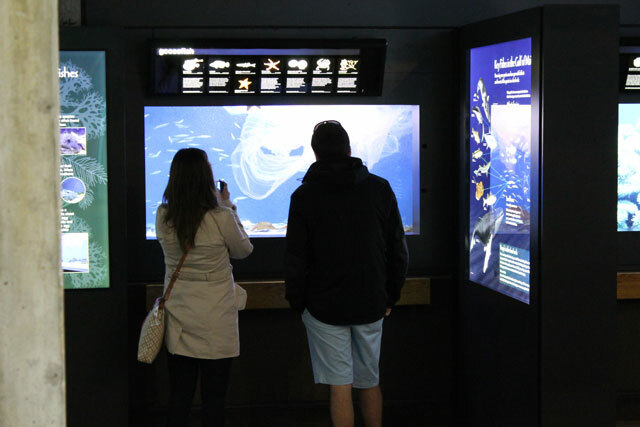 When you walk into the Aquarium's West Wing, it's easy to bee-line right to this beautiful, interactive exhibit filled with gregarious cownose rays and fascinating sharks. But you'd be missing a gem of a tank at the entrance to the exhibit. So stop for second, get quiet and belly up to the live mangrove display on your right. This tank is bursting with life—from speedy fish, to colorful anemones to hermit crabs to the upside-down jellies to live plants! Let's get to know a couple of the stars of this tank so you can impress your fellow visitors with your knowledge. 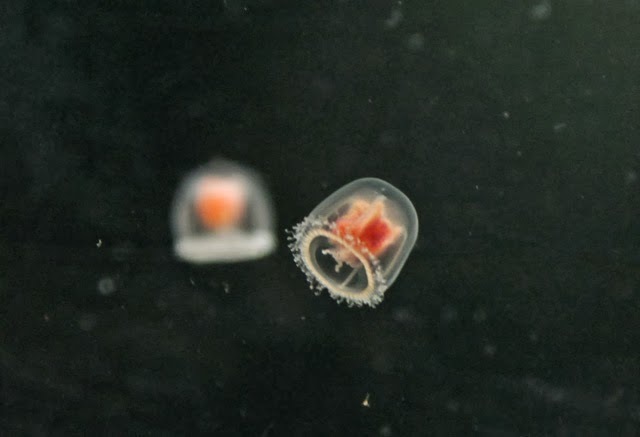 First up, the upside-down jelly, (Cassiopea xamachana). 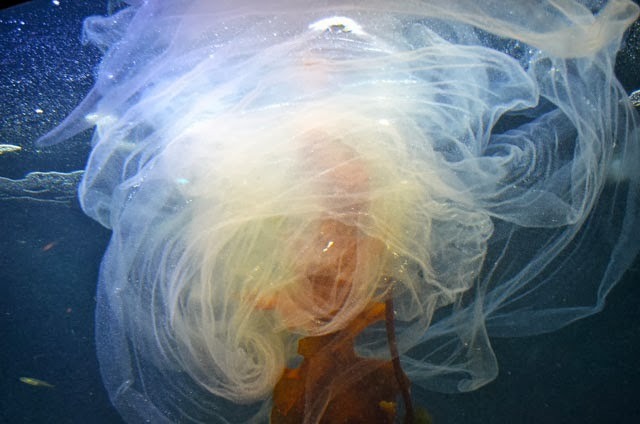 These jellies lie on the sandy bottom with their four branching tentacles left to sway in the water. 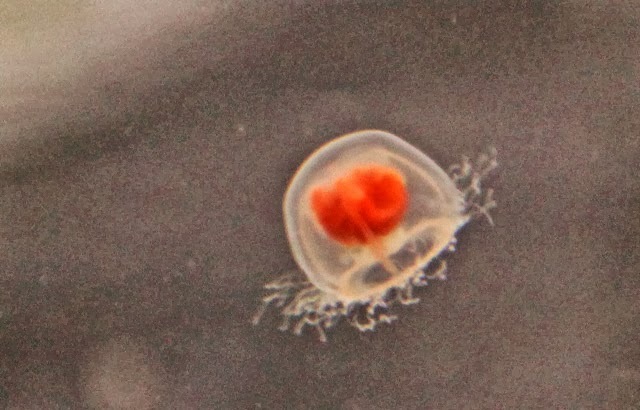 The bluish fringe contains symbiotic zooxanthallae, which are tiny plants that make food for the jelly. 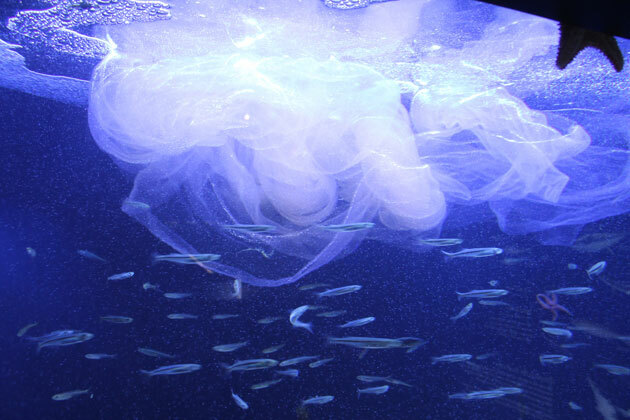 Those tentacles also filter nutrients and plankton out of the water. Scientists studying mangrove ponds in Belize know these tentacles also pack a bit of a sting, too. 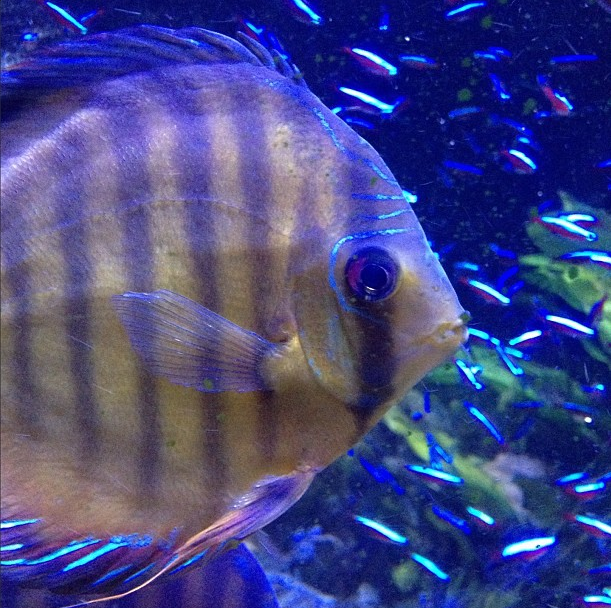 Don't forget the copperband butterflyfish (Chelmon rostratus). 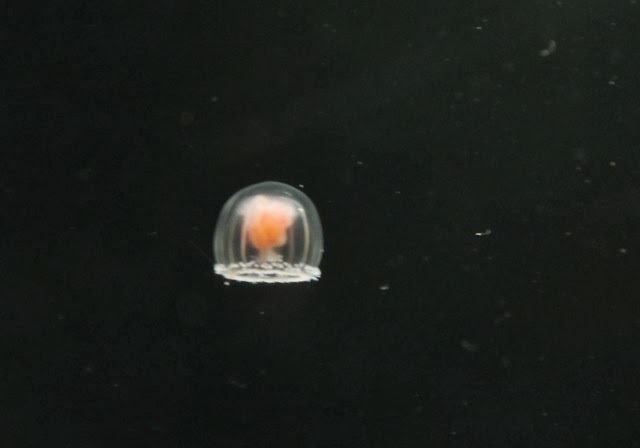 You may have noticed this guy zoom past the camera during the jelly clip. These fast, flat fish have a long snout that helps them eat small crustaceans, worms and coral polyps. 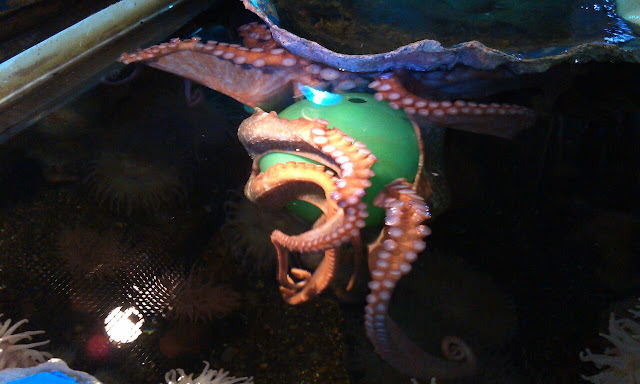 It is an asset to this exhibit, too, because it likes to snack on parasites that might hitch a ride into the exhibit! The double-lined fusilier (Pterocaesio digramma) are easy to spot with two bright yellow stripes against their sleek bluish-silver bodies. While they are related to snapper, they are well adapted to eating smaller prey such as crustaceans that live in the silty layer on the bottom of a mangrove stand. Tube anemones look quite graceful dotting the tank. 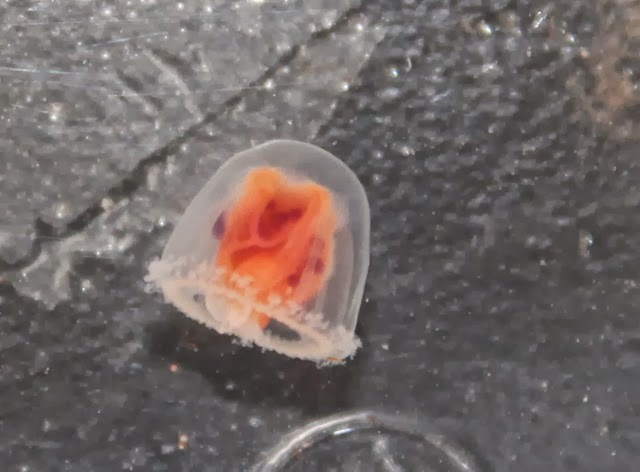 Take a close look and you'll notice two distinct rings of tentacles and a tube-like body. The outer ring of tentacles is for defense and capturing prey. The inner ring is used to manipulate their food. If disturbed, they can completely retract into their tube! 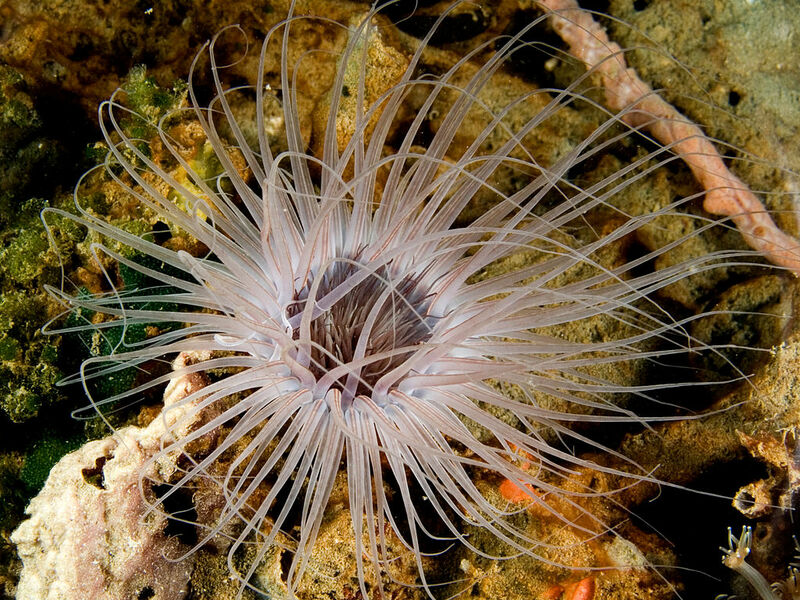 These anemones are different from other anemones, like the green anemones, and attach to the substrate by secreting a hard mucus tube. And what would a mangrove exhibit be without mangrove plants! We have some young plants that have started to put down roots, along with some sculptural mangrove roots. 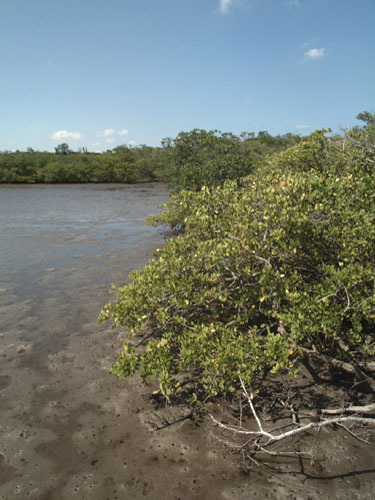 Mangroves are incredibly important marine habitats. They provide a cozy nursery for sharks and other fish to grow up, they are essential for healthy coral reefs, they protect coasts from storm damage and they are a carbon sink! But there has been a 17 percent decline in mangrove forests since 1980, according to the IUCN. With all the animals that call this tiny tank home, just imagine all the marine animals in the wild that are threatened by the loss of mangrove habitats. The best way to save mangroves is to prevent them from being destroyed in the first place. Conservation organizations around the world are working to protect mangrove forests from deforestation and pollution. Ask some serious fish nerds what their favorite animal is and there is a good chance that they will mention cuttlefish, which are both freaky and very cool. Take a minute to watch this stunning slow-motion video (with their real-time counterpart clips) of the cuttlefish feeding and changing color and you'll know what we're talking about. This super-crisp, slow-motion video was a collaboration between New England Aquarium, an underwater photographer, a physicist and a local tech company. At 500 frames per second, the footage appears about 17 times slower than it occurs to the naked eye. 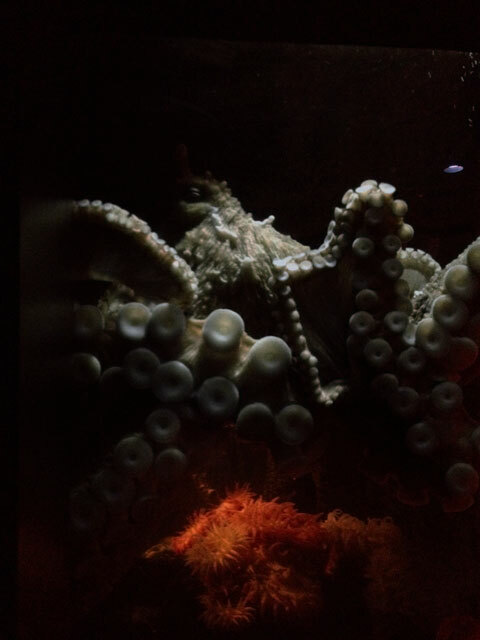 The result: a spectacular new window on cuttlefish in action. 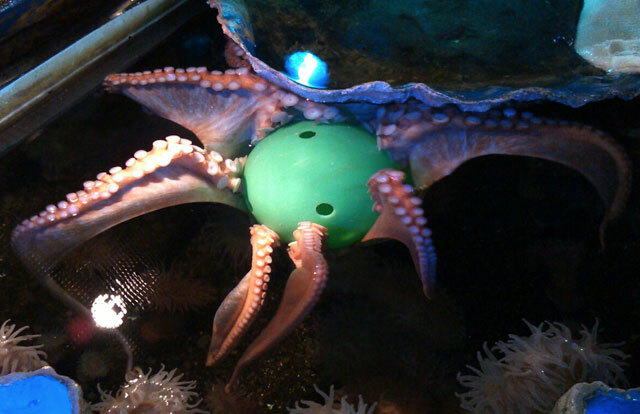 Did you see how this cunning cephalopod captured its food with two shotgun-like tentacles? 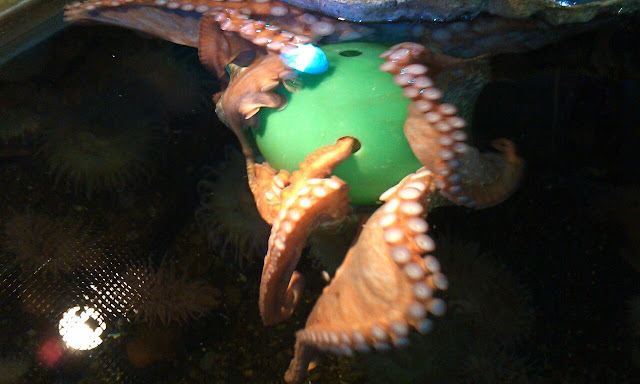 Once it snagged the fish, it pulled it into the grasp of eight waiting suction-cupped arms. Learn more about this stunning video. Cuttlefish are related to squid and octopus. 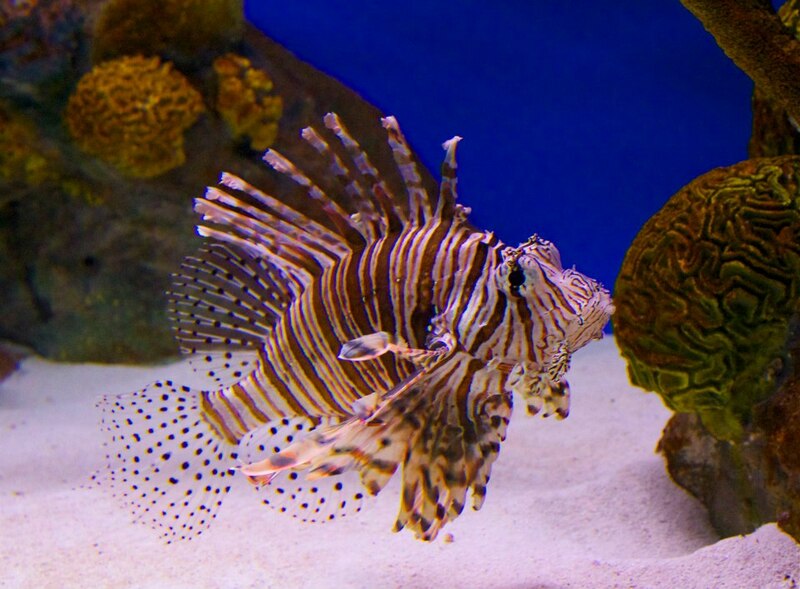 When they feel threatened, they can change color and skin pattern in just a few seconds. The lighting-fast color change is quite subtle in the slow-motion video. 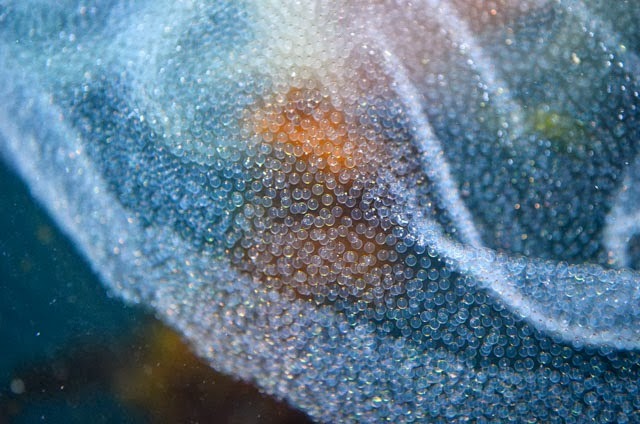 Cuttlefish change colors and patterns to blend into their surroundings. 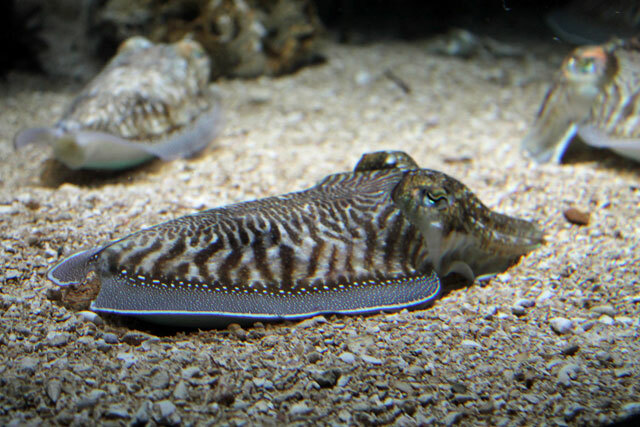 The Aquarium’s cuttlefish tank currently houses nine cuttlefish patrolling the water column, wary of some of their pesky neighbors—rays and guitarfish. Come by to see these amazing creatures in action. 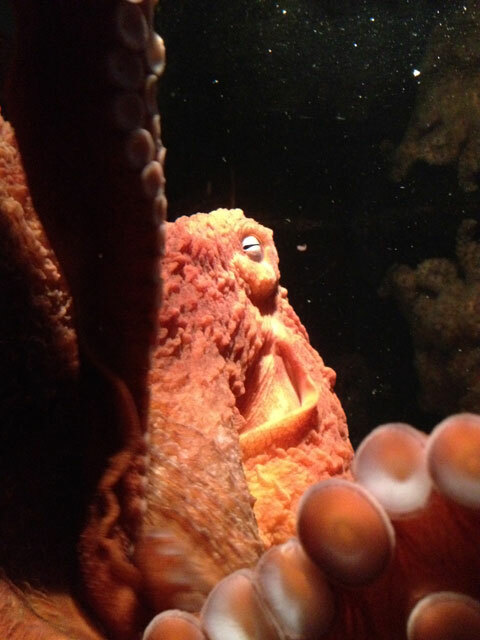 With special construction pricing in effect, you'll save when you come belly up to this exhibit to marvel at their tentacles and color changing expertise. 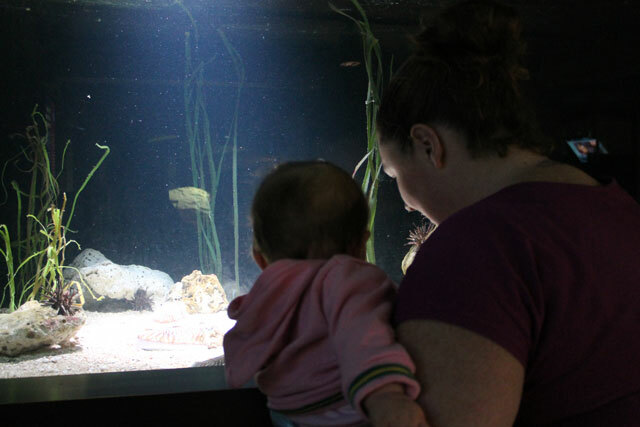 Cuttlefish are fascinating for any age! 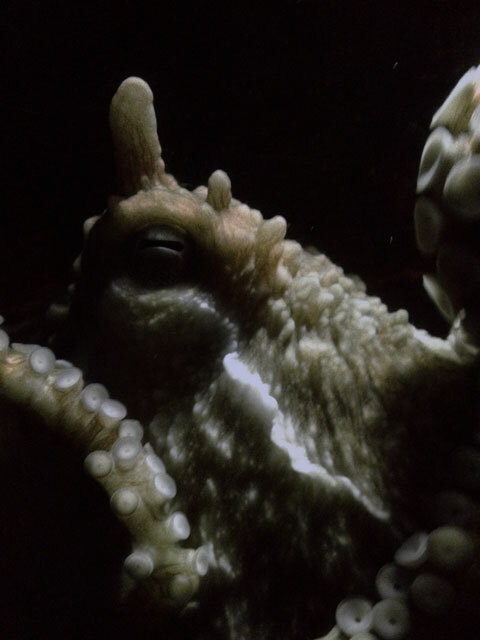 Can't get enough of these cephalopods? Check out these fun facts, and meet some former Aquarium residents—dwarf cuttlefish.